For some thorough commentary on the recent Kenilworth Consultation Game (#6), see John's thorough analysis here. I figured there'd be no harm to add a few thoughts since, given where they're being written, there's no chance of anyone actually reading them. Here Black played Yaacov's 11....g6, which is a move Yaacov 'invented' even though he does not play the Sveshnikov sicilian. If you have this move in your database your database is better than mine (not unlikely). What to make of this? Black is preparing ...Bg7 and King's Indian style play after ...O-O with ...f5 etc. But it's not in theory so it must be bad!? Compared to a normal Sveshnikov where the bishop goes to g5 to contest the key d5 square indirectly (knocking off a knight that goes a3-c2-e3), here Black seems to move his bishop to an inactive square and taking an extra tempo to do so. Yaacov's argument was that d5 is just one square and we could afford White that concession because our play was on the kingside. (I happen to disagree, but compare my rating with his and draw your own conclusions). However, ...g6 is generally played anyhow,so the real issue is does the bishop belong on g7 and if not, what can White do about it? Moves that are bad but are not refuted often become good. 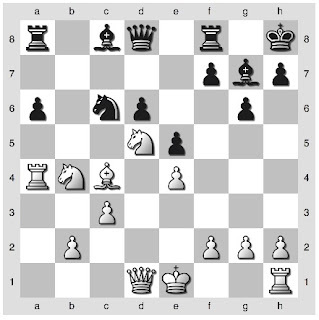 Yaacov likes this move because it preserves the bishop - and to Yaacov for whom bishops are a terrible weapon, "there is no such thing as a bad bishop". 1. Take the bishop immediately. 12. Nxf6+ Qxf6 13. Qd2 O-O 14. O-O-O is a poor idea based on winning the d6 pawn, which Black may even choose to sacrifice if he's in the mood. The White king gets smashed quickly on the queenside (see the work of DA Carrelli on this). 2. Let the bishop die a slow quiet death. In the style of Stoyko. Use the extra tempo to attack Black's queenside. White chose the second method in our game, but also burned a lot of clock looking for the refutation. Part of Black's strategy. Playing book moves would only play into White's hands. Another key point. White has played the slightly anemic 16. Ncb4 and Black replied with the odd ....Bb7?!. Odd especially because we were hoping White would play Ncb4 so we could trade off a pair of knights. But Yaacov didn't like 16. ... Nxb4 17. Nxb4 Bb7? 18. Bd5 when White has a bind. We all missed 17. ... a5! 18. Bd5 Bd7 when Black has no problems. So now White had an opportunity to play the simple 17. Nxa6 when we intended to play ...f5 and start our activity. 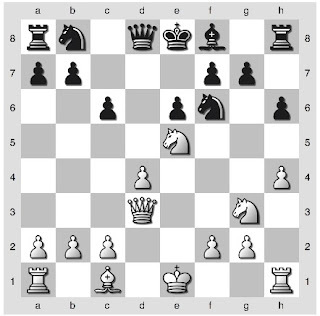 Yaacov thought the resulting position roughly balanced, but Fischer is Fischer but a pawn is a pawn. However, characteristically White took a long time for their reply ("Long think, wrong think? "), whereas in our camp the decision to sack the pawn took two minutes because Yaacov was coaching that certain moves must be played and ...f5 was certainly one of those moves. Instead White came up with 17. Qe2? which evaporates his pressure on the queenside. Anonymous teammates had come prepared with the computer response to White's sealed 31. f4; I had a particularly busy work week so I didn't even examine this possible move, but Rybka's ...exf ep is really counterintuitive. For once Yaacov and I were in agreement that ...Qe6 was the right move to sustain pressure, the passed pawn being a constant threat. 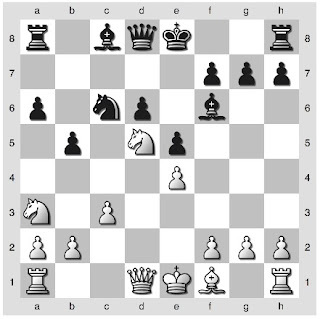 (Conversely, try to find without computer assistance the win in the rook endgame resulting from ...exf). In an understandably difficult situation White ultimately crumbled under time pressure. Finally, unsolicited opinions in response to some of John's provocative thoughts about the format (for anyone who stumbles across this accidentally while looking up the history of Kenilworth, England, please feel free to chime in on the comments section or in person at the Kenilworth, NJ chess club - meets Thursdays at 8pm, please come in the back). 1. Stopped clock for the first 5 moves: I once had the pleasure of watching 14 minutes tick off my clock while my team debated the merits of every possible response to 1.e4. Even a few moves into this game we were debating O'Kelly vs Najdorf vs Sveshnikov vs etc etc. Once we settled on an opening things went smoothly - I like this approach. 2. Time trouble: time is as crucial to these games as in a real game. The teams I've been on are 2-1, the wins coming with good clock management the loss coming with terrible clock management. Coincidence? Maybe, probably not. It's easy to say because we had a blitz superman on our team, but our strategy was to play briskly, maybe missing best moves but trying to play thematic, strong moves. And you will notice this led to an inferior position at points....but only on the board and not in the critical fourth dimension (which is time, for those of you who slept through that part of school). What can be done? You either lengthen the time control (already fairly long), make it a correspondence match (ugh) or accept that time is a crucial factor that must be managed appropriately. I think the real pleasure of these games is to hear what the masters have to say - a little insight into their infinite minds. That said, is once a year enough? Make your opinion known! While working my way through Chess Duels by GM Yasser Seirawan, I finally reached a section devoted to his battles with whom he considers to be the world's best chess player, both past and present; Garry Kasparov. Seirawan referenced Kasparov's only loss on his way to first place in the 1983 Niksic tournament. Observing the post-mortem between Kasparov and Spassky, he recalled, was jaw-dropping. He compares Kasparov's ability to calculate 12 move variations effortlessly leaving Spassky almost speechless to a video of Bruce Lee (?!) playing ping pong with Nunchaku sticks. You can't believe what you are seeing. This is ability on a superhuman level. Perhaps by watching this clip, we can appreciate Kasparov's talent a bit more. This reminds me of the KCC Holiday Party coming up December 23rd. Bring your paddle (or Nunchucks??) if you got 'em. Ping pong tournament is in the works! More on ping pong and chess! Back to the book...Seirawan's story telling style makes it a very entertaining read. Just a nudge more than halfway through, I can already whole-heartily recommend this book. For every giant at the chessboard he played, he includes a snippet into their life. You will appreciate the world champions from a different perspective. Thumbs up! The Kenilworth Chess Club held its second consultation game of the year. We tried something new with the time controls this year. First 5 moves, no time control! Then the next 25 moves in 60 minutes with 5 second delay. 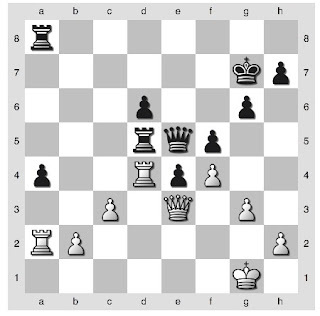 White sealed their 31st move going into next week's time control. Things became exciting once we got into Sveshnikov territory. Showing theory no respect, pawn offerings, backwards pawns, isolated pawns, the bishop pair...this game was riddled with imbalances. The game will finish up next week. It isn't too late to join us at the KCC to see first hand how this battle ends. Below, Yaacov discusses with the Black team how in certain positions, particular moves just "need" to be played. The position calls for it! Thanks to Dan K for the pic. Instead of working with SM Yaacov Norowitz, get the chance to play against him! 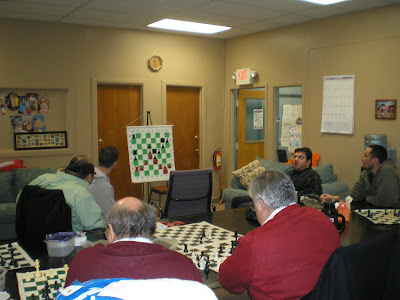 He will be giving a simul at the Marshall Chess Club Wednesday December 15th. Come one, come all. That's right, Black is happy to trade off his 'good' bishop because, after the exchange the position is already essentially equal. White's space advantage is almost meaningless because there are too few pieces on the board. 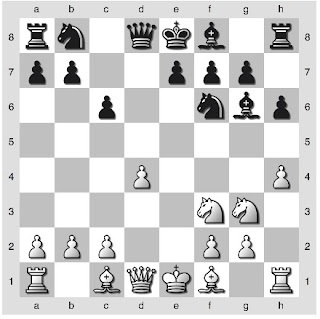 Note this is not possible in the main line because a knight on d7 would be screening the queen from defending d6. 11. Bd2 c5! 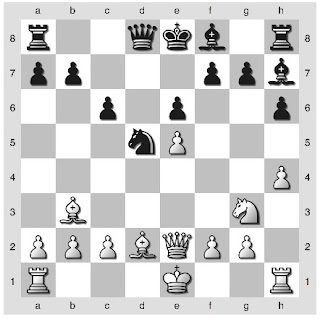 White gets a taste of Black's main idea - c6-c5 not only can't be stopped, it is also strong! 12. O-O-O Nc6 and here Black has the unusual and important achievement of planting his knight on c6. Black has scored well from these positions. In comparing this position to the main line, the h-pawn is on h4 rather than h5 and the knight is on e5 rather than f3. White's task is to make the latter point important. With sharp attacking play possible - White can, as in the main lines, aim for a g2-g4 push while Black will press with c6-c5 and use the semi-open c-file to attack the White king. White has generally scored well from this position, however. where again White aims for an attack on the Black kingside, an attack that is strengthened by the presence of the light-squared bishop, but this bishop is a target for an attack by ....a7-a5-4, and White must weaken his queenside to stop this attack leading to sharp play. An attacking game along these lines is DeFirmian-Brunner 1995. Conclusion: 7. ... Nf6 leads to interesting play that is independent from the main line. However, White seems to be doing well if he pays attention to Black's plan of ....c6-c5/Nc6. With his now standard last second heroics, Joe D put us over the top 3-1. More here.